Holy crap, what a year! This was my most accomplished year so far as a photographer, in terms of travel, photography, and new projects. It seems like I rarely had a moment’s rest, and indeed, I spent about half of the year on the road. Exhausting and frantic, but incredible fun, and I wouldn’t have changed a thing. So if you’ll indulge me I’d like to share with you the highlights of my 2016. Having moved to the ski town of Mammoth Lakes in late 2015 I decided I was going to learn to love the winter. As part of that effort I took a winter mountaineering skills course in January in order to feel more comfortable in the backcountry in the snow. And while the course itself had nothing to do with photography, it opened up doors to journeys and adventures in the mountains in the future. Can’t wait to see where those skills will take me and my photography. Here’s where the traveling began. My buddy, Scott, is a white water rafting guide and for a few years he spent the North American winters down in Chile, guiding on the Futaleufu River. He had extended an open invitation to me so in February I decided to take the opportunity to visit him and do some rafting, but also to explore the northern reaches of Chilean Patagonia. My sister also came along, which was exciting as it was her first international trip. Patagonia is truly as spectacular as everyone says, and though my limited time meant I couldn’t get to the popular and dramatic south, I was able to spend quality time in the very northern part of Patagonia. My time there was highlighted by a demanding but lovely 4-day trek through the forests and mountains of Cerro Castillo National Reserve. Think glaciers, jagged peaks, azure rivers, and lenticular clouds and you’ll get the idea. In March I found myself back in California, albeit briefly. However, during the few weeks I was home Death Valley’s incredible superbloom occurred. October 2015’s insane rain and flooding set the stage and provided the perfect kind of moisture for millions of wildflowers to bloom once spring rolled around. I was fortunate to visit for a weekend during the peak of the bloom when both the flowers on the ground and the clouds in the sky put on a spectacular show. As spring continued to develop in the north hemisphere it was time for me to travel to the southern to visit one of my favorite places on Earth: New Zealand. Jim Patterson and I were there to lead a 12-day South Island Photography Workshop, and I used the opportunity to create a 6-week photo safari for myself. The workshop kicked things off in gobsmacking style, with some of the best conditions I’ve ever experienced in NZ. Rainbows, reflections, electric sunrises, god rays…you name it, we shot it! After the workshop ended I was fortunate to meet a wonderful traveling partner in the form of a French ultra runner named Jessica. We spent the next 3.5 weeks traveling the South Island together getting into all kinds of adventures, the highlights being a cruise through Doubtful Sound, and an ill-timed trip to the Mueller Hut in Mt Cook National Park, where we got stuck for three days during a blizzard and ultimately had to be rescued by helicopter. Those three days held some frightful moments, but also some breathtakingly gorgeous ones. In late May I returned from New Zealand and was able to spend a few quiet days at home enjoying the Eastern Sierra, some late spring snowboarding, and a few local photo outings. My summer kicked off with a whirlwind of domestic trips. First was a visit to the Palouse region of Eastern Washington for another workshop. It was my first time in the area and I was completely floored. I typically don’t photograph man-made landscapes but the rolling ag fields of the Palouse are utterly mesmerizing. After our workshop in the Palouse I headed east and made my first visit to Glacier National Park in Montana. This place is stunning, and that is an understatement. I was invited to the park by Fusion Network to help them produce a short video about climate change and the national parks. Once the shoot was wrapped I met up with my friend Elisabeth and we trekked out on a couple of fun backpacking trips through Glacier’s jaw-dropping scenery. It’s safe to say it’s a park I’ll be visiting again. In early July I was back home for a few weeks and I took advantage of the downtime to head out on a few pack trips into my beloved Sierra backcountry. The first was up Big Pine Creek, to the Sierra’s largest glacier, the Palisade Glacier. It’s one of the few places in the Sierra where the lakes contain glacial milt, and as a consequence their green color has to be seen to be believed. A week later my sister and I made the leg- and lung-burning ascent to Sailor Lake in the Sabrina Basin, high above Bishop, California. The mosquitoes were as numerous as I’ve ever experienced in the Sierra, but so were the stars, so everything balanced out. In the second half of the month I flew to Europe to explore one of my long-time travel dream destinations, the Dolomites in Italy. This section of the Alps is a magnificent array of mountain spires and the scenery is remarkable everywhere you look. In addition, access is incredibly easy in the Dolomites, meaning with a few short walks it was possible to be in breathtaking mountain cathedrals. In August I continued my trip in Europe, but shifted the focus away from photography and towards being social. I was able to meet up with friends in Italy, Croatia, Hungary, Germany, and the Netherlands. And finally I made my way to France to reconnect with Jessica, my traveling partner from New Zealand. Together we journeyed into the Pyrenees and climbed Vignemale, the highest peak in that range. I spent the entire month of September at home in Mammoth Lakes enjoying some down time, working on some projects behind the scenes, and going on local excursions. I was honored to be asked to speak at an Instameet at the beginning of the month, and at the end of month I completed a climbing objective of mine and stood atop Cathedral Peak in Yosemite National Park. We kicked off October with another workshop, this time in the Eastern Sierra, chasing fall color. Then immediately after the workshop wrapped, I packed my bags and headed for Utah. My friend Julia had planned a SW trip (all the way from Hungary!) and had invited me to go along. It was my first time back to Utah in over five years and I was excited to see all that red rock again. We both wanted to visit areas we hadn’t been to before and consequently ended up doing some technical canyoneering in Zion (replete with freezing cold water), some backpacking in Escalante, and some back road driving in Capitol Reef. The trip was varied, incredibly fun, and sensationally beautiful. At the end of October I visited Photo Plus Expo for the third time to see old friends and make lots of new ones. In October I also launched my newest passion project, the Nature Photography Academy. It’s a place where photographers can access the absolute best photography and post processing video courses in order to really gain a deep understanding of what it takes to produce beautiful landscape imagery. In early November I led a small workshop in that most beautiful of parks, Yosemite. Despite the chronically sunny skies we found an incredible abundance of things to photograph, and were treated to at least one nice light show. Then in the middle of the month I was able to head back to Utah for a commercial shoot. As a landscape photographer I rarely am hired specifically to shoot, so this was an incredibly exciting opportunity. I can’t share any of the project details yet, but hopefully within the next month or two I’ll be putting up photos and stories about the shoot. And that brings us all the way to the end of the year! Jim and I had one last, fun-filled workshop in Death Valley, a park I grow to love more every time I visit it. And that’s pretty much all she wrote, aside from a few local shoots here and there. I’m exhausted now just writing about and remembering this year. I can’t believe I actually got to live it as well. I’m endlessly grateful for the wonderful experiences I had this year, for the people I met, the friends and family I spent time with, and for everyone out there who’s supported me as a photographer. I hope your 2016 was amazing, and that your 2017 will be even better. Until next time, be excellent to each other, and party on, dudes! Fantastically good stuff Josh! ( wasn’t I your landlord in north Oakland at one time? Sorry if I’m mistaken). Truly great photos, do you share any of your equipment info? For equipment I use a Nikon D810, Nikon D750, and 90% of the time either the Nikon 18-35mm lens or the Nikon 70-200mm lens. I’ve just now caught my breath. Thanks for the equipment info above. Now I’m wondering if there’s significant post-shooting lab work involved in bringing out that phantasmagoric color . . . and whether you had to use some stitching to get that foreground-to-infinity sharpness. If you can’t impart much of an answer(s) to me here . . . can you cite any articles?…Courses? you’ve participated in? Thanks. Congrats again . . . and here’s to an even more awesome ’17, photographically and in every other way. Thanks a ton! I do post work on every photo, but exactly how much varies from shot to shot. I try to keep things simple though to let the light and landscape speak for itself. Most of the time the colors are already there, they just need a little help to pop. Some contrast, and a little saturation usually does the trick to get good color without being garish. As for the Depth of Field question, most of the time I simply use a single shot with a small aperture. But occasionally I’ll use focus stacking if the situation / composition calls for it. In this series of images I believe there’s only one focus-stacked shot: the one of the flowers and sunburst from my July trip to Italy. That’s maybe 4 or 5 stacked photos. What an amazing collection of photographs. Truly an amazing year with great adventures! Jack, I really appreciate that! 2016 was indeed a wonderful year, and here’s hoping 2017 will be even better. Wishing you the best as well for a fantastic and fun year. Much appreciate, Bibek! Happy 2017 to you. Truly beautiful photography and editing. Thanks for sharing. Thank you very much, Joanne! I’m glad you enjoyed the photos. Ain’t that the truth! Find the places you love and spend time there with the people you love. Recipe for a pretty good life. Happy 2017, Barry. A fantastic collection of stunning photography Josh, keep up the good work. Hope to join you on one of your workshops one day. Cheers, Angus, I really appreciate that! Would love to have you on a workshop whenever it works out for you! I grew up in Kalispell which is only 30 miles from Glacier NP. Used to spend a lot of time in the park. of course I wasn’t into photography then. Hoping to get back there this spring or fall for the colors. I really like your pictures from the Huayhuash as I spent 15 days in 2014 trekking the region. Amazing place and would like to get back some day. Keep up the awesome work. I look at your photos as inspiration for mine. Cheers, Randy. I really appreciate your kind words. Isn’t Huayhuash just a mind-boggling amazing place! I’m happy you had a chance to experience it. Most beautiful mountains I’ve seen to date. Of course, Glacier ain’t so bad either. Enjoy your trip out there this year. May the light be with you! Josh, many of us envy your lifestyle, but all of us admire the wonderful images you have captured. WOW! Truly an outstand year of pleasure and work. Thank you, Bruce! When I was struggling to pay the bills and racking up massive credit card debt in my early years I had no idea I’d ever have a year like that. Here’s to the future, may it be bright for you in 2017. Just beautiful work! Can’t wait to see where 2017 takes you. Unreal! Can’t wait to see what you come up with in 2017! Cheers from Canada! Thanks, Andre! That’s one of the most exciting parts of photography for me: never knowing what I’ll see in the future. 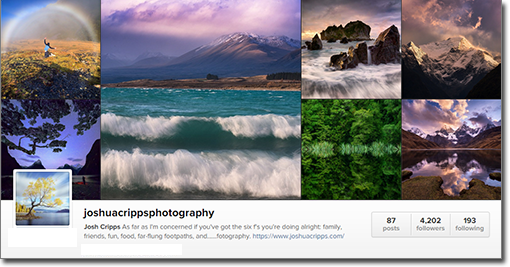 Thanks so much for sharing Josh – both the images and your vast knowledge. Every time you post a video or image I am reminded just how beautiful this earth is and how much I need to get out and explore. Great to hear from you! I hope you are living well and having tons of fun photo adventures yourself. And thank you so much for the kind words! Absolutely had a blast out in Death Valley with you, and looking forward to the next time! Josh – such a great, wonderful, and inspiring of your BEST 2016 adventures & activities! I want to read it again and again and admire your breathtaking photos. Thanks for your generosity to share your BEST 2016 with all of us. Love everything about you! Cheers! No, thank YOU for the support! It really makes my day to read about so many people enjoying my photography. What a dream year for you, Josh. I am inspired by your photos. You seem to capture some incredible, I might add, stunning landscapes. Thank you for sharing. Thank you, Mary! This was definitely one for the books. You’re one of my favourites, Joshua. You’re super talented and you share it well with the world. Best. Aubrey, that is so sweet of you to say! Thank you so much. Hope you have a wonderful year. AH MAZE ING!!! What a year and what great pictures. If I can take one photograph this year that in any way compares to any of yours, then I will be very happy. Keep up the great work on your Tutorials, Videos and Tips, they are invaluable to me and I am sure, many others. I’ve learnt a lot from your recent trio on ND Grad Filters. Thank you so much for that generous comment. I am so happy you are enjoying and utilizing the tutorials and videos. Really makes my day to hear that. All the best and happy shooting! Absolutely beautiful! Thanks for sharing. I am thinking of updating my D5500 to a D750 or D810. I take a lot of pictures of landscapes and nature. Which camera do you prefer for landscapes? Thank you, Christine! Both the D750 and D810 are incredible cameras for landscape; the image quality is spectacular. If I had to choose just one I’d pick the D810 because of the extra detail, and the way the camera handles. It just works. The D750 is better for night photography and for hiking because it’s smaller and lighter. Hope that helps! Awesome photos, Mr. Cripps. Thanks for sharing. Livin’ the dream, baby… We’re planning on going to Yellowstone next year. Would a side trip to Glacier be worth the time? Thank you! In my opinion a side trip to Glacier is 100% worth the time. It’s one of the most stunning collection of mountains I’ve had the privilege to see. Josh your photo’s are amazing, You are a true professional photographer, I wish I could take a shot like yours. I learned a lot from your photos. Look forward to see some more. Keep up the good work. Thanks a ton, Rais! All the best to you for 2017 and happy photographing! AMAZING photo’s Josh!!! On the next photos can you put the ISO you use, the f our the speed of the photos?? Cheers, and have a wonderful year! Truly AMAZING AWESOME photos what a wonderful life you have being able to see such wonder on your travels with lots of memories to hold on to. Keep up the good work and I look forward to seeing what you produce for us in 2017. Thank you so very much, Lynda! Wishing you the best for 2017 as well. Beautiful photography! I just found you on YouTube looking for guidance on DSLRs. I recently upgraded from a point and shoot to a Nikon D5500. I’ve spent the whole morning “not working” and scrolling through your website! Just amazing! Wished I lived in beautiful area like you do. Thank you so much, Lisa! I’m happy to hear you’ve taken the plunge into photography. May it lead you on many great adventures. Josh, firstly these images are absolutely jaw dropping…. wow! As a mountain and landscape photographer myself, your work is truly an inspiration to me! These photos are beautiful. I especially love the ones with flowers in the foreground and mountains in the background. As someone who is new to photography, and is thus far self taught, I stumbled upon your youtube videos last night, which led me to your website. I subscribed to your videos. 🙂 I think I will find them very helpful. Keep taking great photos for the rest of us to see! Inspirational and informative! I found you on youtube looking for Adobe Camera Raw tutorials and you blew my mind in 5 minutes! Quick question on landscape aperture. Should I avoid stopping all the way down, and maybe shoot in f11 or f16 or is f/22 or f/36 better for getting everything into focus? And is there a general limit to how long you’ll leave the shutter open during the daylight/sunset? To answer your question about aperture, generally the farther you stop down the softer the details of your image will become because of diffraction. For this reason I generally use the smallest f-number possible that gives me the depth of field I want. And the only limit I put on my shutter speed during daylight / sunset is to prevent over exposure. But if you are using a strong ND filter, like a 10-stop, then multi-minute exposures are possible, no worries!